Made with a medium-weight black cotton, this knee-length happi style robe is ideal for wearing as a dressing gown. A stunning dragon is embroidered on the back of the gown. 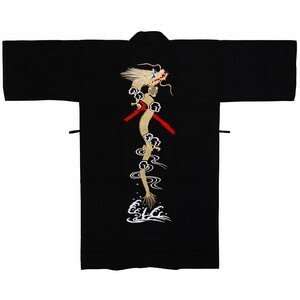 The kanji character embroidered at chest level on each front panel is "ryu" (dragon). Recommended for medium to large build; height 5ft9" to 6ft.